Snow storms and freezing temps have been the story of my life this Winter. Spring is coming, but I can't tell today because it's -6 outside! Think warm thoughts, I tell myself. But when I open my eyes it's still there. Signs of Winter are everywhere! I just want to take a break. A vacation, if I could. But where would I go? Miami would be nice. LA sounds even better. Beautiful sandy, beaches in Mexico sound tantalizing too! If I did go on a warm vacay, I would need to go shopping first! 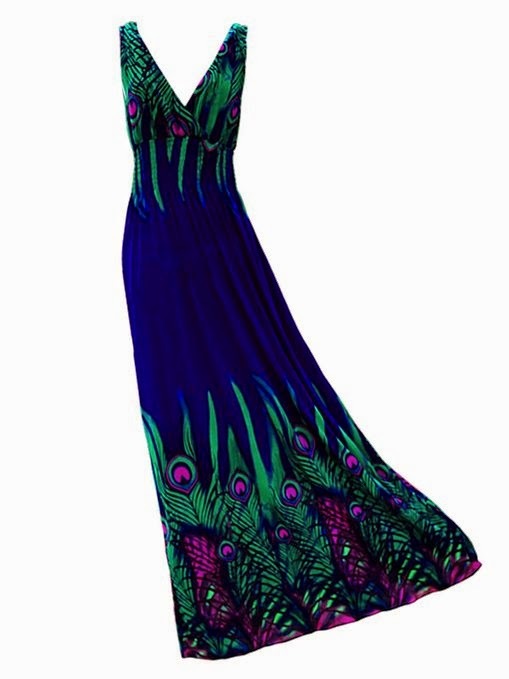 A bright, cheery,Hawaiian Sundress like this one. 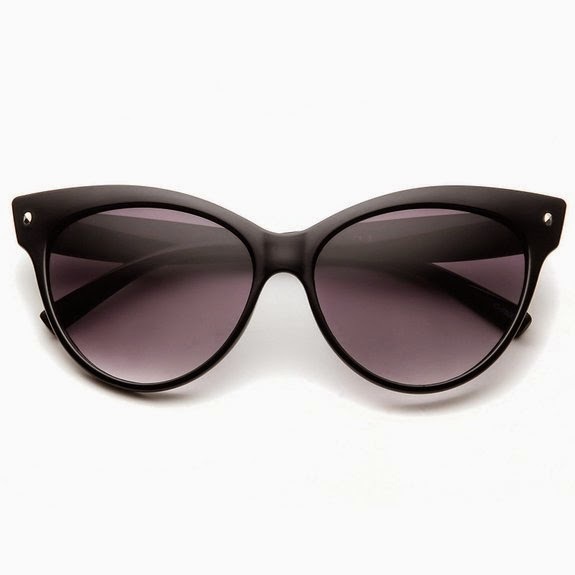 Cat Eye Sunglasses! They're going to be big this Spring & Summer. 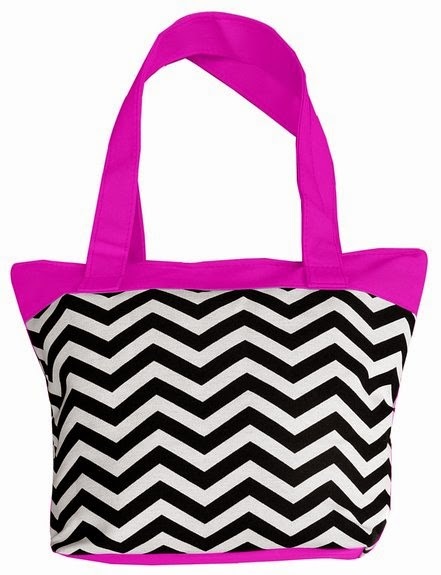 Now you know I would rock this Fuchsia Chevron tote) at the beach. Gold Sandals to match a golden beach and sunrise. Oh well, a girl can dream can't she? Are you planning any sunny vacations for Spring Break? Ooooo… I ain't wait for warmer weather!!!!! Although, it's NOT that cold here in the ATL but looking at all the snow pics else where is enough for meeeeee!!!!!! Yeah, I'd take a trip to ATL right now! But it looks like warmer weather is on our horizon! Thank the Lord! Nope. I'm dreaming too. That peacock dress is gorgeous. Girl, I hear ya! That pretty blue dress caught my eye too. I hope a vacation is in my near future. It's been years (at least a decade) since I've been on a realvacation. I wouldn't mind living by the ocean, on a beach, so I can have little vacations everyday. Yesss! Living on or by the beach sounds so nice,...I guess until hurricane season. You're good at putting outfits together. I also enjoy traveling. I hope you're able to have your dreams come true soon enough! Thank you! I hope so too. Until then, I'll enjoy this burst of Spring we're now having. We have also been hit with snow and ice storms over the past three weeks and thank goodness it was warm and beautiful yesterday, so we could finally get out and enjoy the sun without it faking us out with 20 degree weather. We usually do not go anywhere for spring break. However, our summer list is growing. Happy Spring Stay-cation! Sounds all too familiar. Glad you were able to get outside to enjoy some warmth. Happy Spring to you too! I'm ready to be sunkissed. I've had enough of the white stuff. I'm ready to let my toes out and let my dress blow in the wind. Ooh yes girl, me too! I can see it now. I am OH SO Ready for Spring! I love a nice dress and cute sandal!! Spring will be here before your know it. Take every opportunity to soak in the sunlight and beauty.